Designed for site-based professional learning., each module includes facilitator notes, slide deck with embedded video, and participant materials. We believe that change happens through collaborative teams. Through the thoughtful use of these tools and resources, learning communities can work toward the vision below. that attends each year to community safety and building off of each other’s unique strengths, so that our team grows and develops, working towards sustainability. 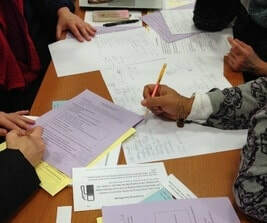 Resources for collaborative planning, peer observations, sharing protocols, and more. These resources can be adapted to meet the needs of your learning community.